I finished Gordon Ramsay's book, Roasting In Hell's Kitchen, and it was entertaining. Pulp Non-Fiction. I appreciated that this book was very clearly written by Mr. Ramsay and Mr. Ramsay alone--that was his voice on the page. With his pursuit of perfection and control freak nature, his tv persona makes so much more sense. He has a passion to make great food and his number one reason to do so is for the customer, not for himself. He's fascinating and unbelievably successful and inspires great loyalty from his staff. More power to him. And it is F A S C I N A T I N G! A complete page turner. Gripping. Riveting. For a government report, it is well written and clear. I'm only on about page 40 and it starts with what happened on each flight, transcripts, technical aspects, etc. Then it moves on to the FAA and the Military and what was "supposed" to happen in the event of a hijacking. But this situation was so insane, so above and beyond just about everyone's imagine at that point, that things got very confusing. And you can't really blame anyone on the ground for doing or not doing something exactly right. So far, I can highly recommend you buy this (available at any bookstore for about $10) and give it a read. Do you think 9/11 was a giant government conspiracy? This site made me laugh -- just at the title! There is no 9/11 conspiracy you morons. 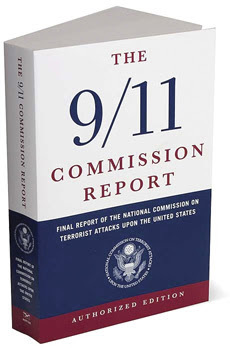 There is also this article: Debunking The 9/11 Myths. Odd moment for us six years ago: Sunday, September 9, 2001, Kurt and I flew home from Boston/Logan Airport on United Airlines Flight 175. Two days later, in the comfort and safety of our living room, we watched, along with the rest of the world and my mom who was visiting just then, as the day's events unfolded. When we heard what flights they were, we looked at our ticket stubs, still sitting on a table and shook our heads about that same flight. Strange strange day.